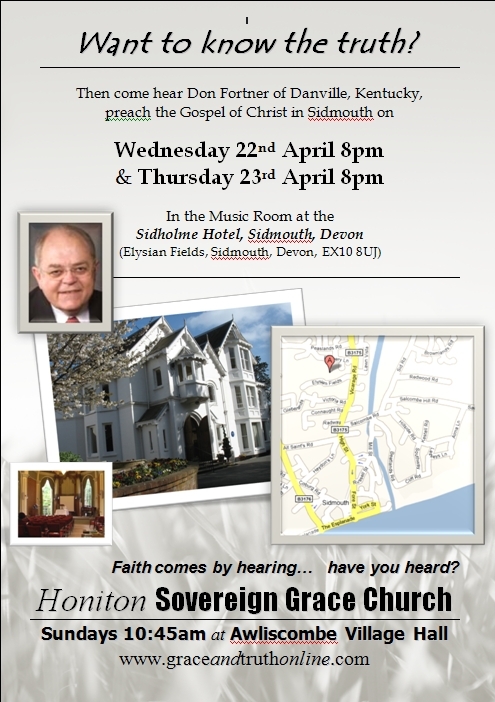 With little more than a week to go we extend a further welcome to GraceAndTruthOnline.com’s 2009 Sovereign Grace Conference to be held on Wednesday 22nd and Thursday 23rd April at the Sidholme Hotel in Sidmouth, Devon. Following his visit to this area last year we are delighted to welcome back Pastor Don Fortner as our speaker and would like to invite all those who are able to come along and hear him on this special occasion. Don Fortner’s ministry has been a great blessing to us over the years, a ministry in which the Lord Jesus Christ is always exalted. We trust that others too will find encouragement in hearing this ministry in Devon. May Christ be glorified in the preaching of His Gospel. For the second year running our venue for the conference is the excellent Sidholme Hotel in Sidmouth Devon. This is situated about 30 minutes south of Honiton on the beautiful East Devon coastline. Not only will visitors be able to attend the meetings at the Conference, but for those who are travelling from afar and wish to make a break of it rooms are available at excellent rates at the hotel – this will also provide opportunity for fellowship with others staying at the hotel. Bookings can be made through the hotel website (http://www.sidholme.co.uk) or by telephone – 01395 515104 (Mention the Sovereign Grace Conference when booking). Alternatively there are of course a number of other good hotels and B+Bs throughout the East Devon area (a quick search on the internet should find some).